The holy village only recently opened to non-Muslim visitors, which is why it is one of the country's most authentic and untrammeled outposts. Moulay Idriss sits in the foothills of the Atlas Mountains. In the early spring, when I visited Moulay Idriss, the climate was at its most Mediterranean. The four-hour drive from Casablanca took me through forests of cork oaks, their bark stripped to arm’s reach to make corks for wine bottles. The greens of the countryside were muted and slightly dusty, the air was soft, and there were olive trees everywhere. Left: Dinner on the terrace at Scorpion House, a private rental house. Right: A guest room at Scorpion House. Moulay Idriss was, until recently, off-limits to non-Muslims between 3 p.m. and sunrise—Wharton had to continue on to nearby Meknes to spend the night. This was because of the town’s holiness: it is a pilgrimage site, the burial place of Moulay Idris Al Akbar, a great-grandson of the Prophet Muhammad. In 2005, Muhammed VI, the current king of Morocco, issued a decree to open the town to non-Muslim visitors as part of his plan of Western-oriented reform. Despite the lifting of restrictions, the tourism infrastructure that is so ubiquitous throughout the rest of the country has been slow to arrive here, and the place feels suspended in time. Centuries before Moulay Idriss became sacred to Muslims, Romans occupied the region. To reach the town from Rabat or Casablanca, you must navigate around Volubilis, the ruin of an ancient Roman city about three miles away whose unesco listing describes architectural influences that “testify to Mediterranean, Libyan and Moor, Punic, Roman, and Arab-Islamic cultures as well as African and Christian cultures.” The farmers in the area tell stories about turning up bits of antiquity—broken relics and Roman stones—when tilling the earth. The logic of Moulay Idriss, when seen from Volubilis, becomes clear: it’s a raised, defensible outpost, surrounded by arable land, which allows occupants to see intruders approaching. The town’s history has imbued it with its own patchwork quality. After the Romans left, it became the seat of an Islamic dynasty. Then, following the French conquest of Morocco, it was remade as a weekend destination for the ruling class. Left: A donkey in one of Moulay Idriss’s many narrow painted alleyways. Right: A young friend of the owners of Walila Farm on the property’s terrace. One reason the Romans chose Moulay Idriss was for its potential for making olive oil, which is today the town’s primary product. Once a week, a member of each family takes a bushel of olives and a jug to the local press, watches the machine churn, then collects the oil to bring home. 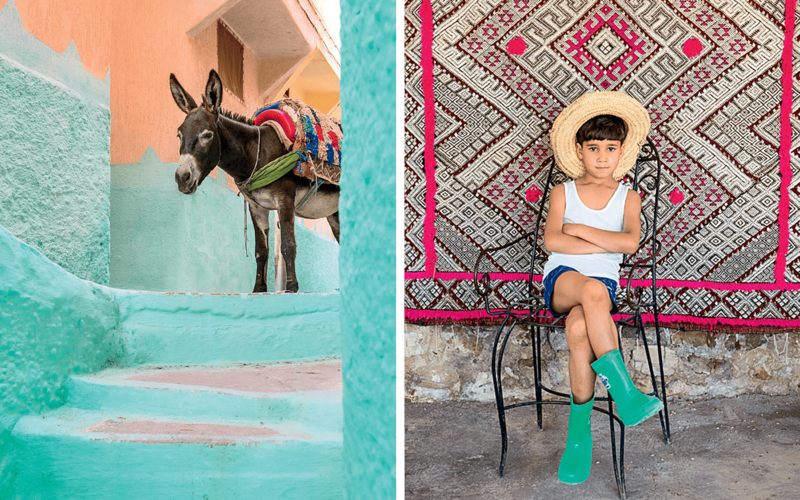 With just under 12,000 residents, Moulay Idriss is by no means a large town, but it feels even smaller than it is. The only other Westerner in town is Mike Richardson, who left the London food scene to set up Café Clock in Fez, then bought a weekend home in Moulay Idriss. After renovating it to emphasize its open fireplaces, terraces, and picture windows, he opened it to guests as Scorpion House—or Dar Akrab, in Arabic—in late 2015. It hangs on a cliff just below the city’s lookout spot. The terrace where cocktail hour takes place at sunset is an excellent place from which to study the panorama of the adjacent hill and discover that various sections of town are each painted their own pastel shade. It’s also a good vantage point for observing the “promenade hour,” which in Moulay Idriss begins at about 4 p.m. and continues until nightfall. As the streets fill up, so do the windows. “People here love to sit and watch,” one local told me. When darkness arrived, Richardson and I stayed out on the terrace under a single light, eating rabbit that he had stuffed with merguez sausage and dates. 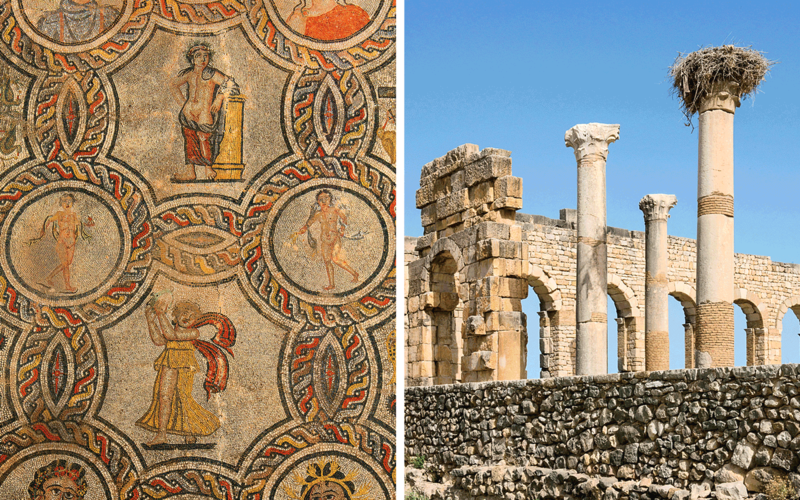 Left: A mosaic in the ancient Roman City of Volubilis. Right: The ruins of Volubilis. Moulay Idriss was built for donkey traffic. It is threaded with arteries that are less streets than openings just wide enough for a pack animal loaded with goods. One afternoon, lost in the maze of streets, I had to ask two young engineering students for directions. As they walked me home, they explained that development in Morocco follows a particular process that has remained unchanged for decades. The king arrives in a region, the people make their requests, and he allocates a budget. Several months later, he comes back in disguise to see whether what he commissioned is actually being carried out. I asked what sort of disguise. “In glasses, or with his trousers torn,” one said, in a manner that suggested the answer should have been obvious to me. I went the following day to the town’s hammam. It is heated with burning olive wood, the scent of which floats into the street. Inside, though, the atmosphere is less like a spa than a communal bath full of screaming women. They brew afternoon coffee there while holding what could be called the town congress. I got so caught up in their interaction that I found it hard to leave. One of the area’s best-kept secrets is Walila Farm, positioned between Volubilis and the two hills of Moulay Idriss. Built in 1920, it was once the weekend home of Michel Jobert, the French foreign minister under Georges Pompidou and François Mitterrand, who wrote a novel about the house. It had fallen into disrepair when Azzedine Zayr, a Moroccan who had spent many years working as a chef in Belgium, bought it in 2000. His renovation turned it into one of the most tranquil guesthouses I have ever visited. The Jobert family remains present in every detail, from the original tile work and furniture to the books in the library. Gardens and a copse of pine trees surround the house, with fields beyond where Zayr grows ingredients for the European-inflected traditional Moroccan dishes he serves to guests. Wild orange blossoms were flowering between the organic, hand-farmed crops when I visited. Zayr crushed a fragrant handful and held it up to my face to inhale, releasing a delicate perfume. 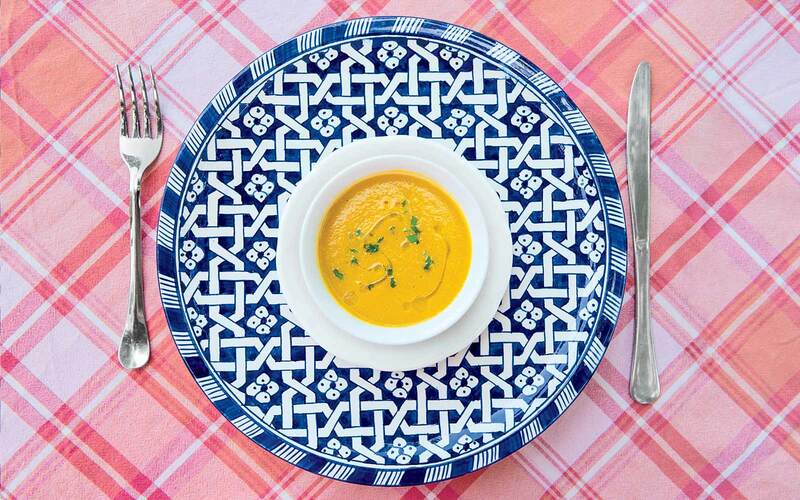 Pumpkin and vegetable soup at Walila Farm. Later that afternoon, he put the blossoms in a tea for me. As we sat in the garden eating a veal tagine, quinces, and dates from the trees that shaded us, a lamb grazed near a chunk of Roman stone that had rolled down the hill from one of Volubilis’s crumbling columns. If you walk to the top of Zayr’s land, you can look down on the valley and the slip of a river and see the same sweep of muted greens and patches farmed by hand and donkey that the Romans would have seen. This is a place where time unfolds and history passes, changing nothing. The closest airports are Fez (a 1½-hour drive) and Casablanca (3½ hours). 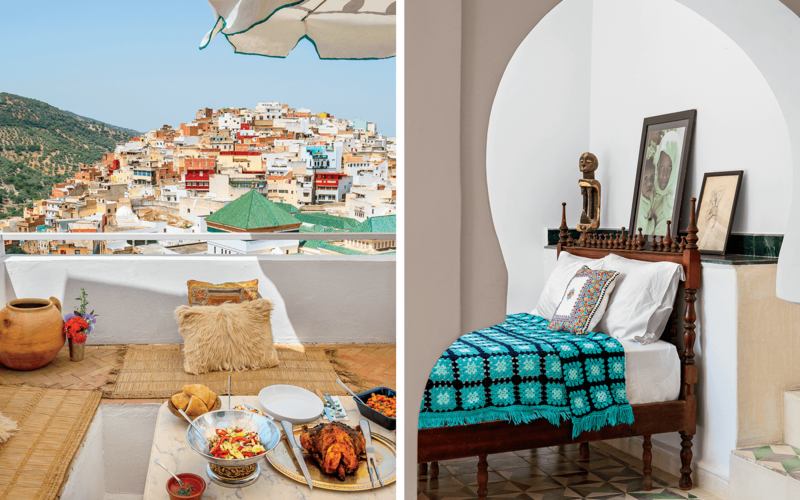 Dar Zerhoune A five-room B&B inside a traditional Moroccan home with a dining terrace and some of the finest views in town. dar​zerhoune.com; doubles from $66. Scorpion House Mike Richardson, the former maître d’ at the Ivy and the Wolseley, in London, has opened his weekend retreat as a guesthouse with meals he prepares himself. scorpionhouse.com; house rentals from $326. Walila Farm A historic home in the countryside that offers accommodations as well as meals prepared from ingredients grown on the property. 212-6-520-96-373; doubles from $50. Roman Baths Ask your host to point the way to the path leading to these ancient thermal baths, said to have curative properties. Volubilis Once the capital of a remote corner of the Roman Empire, this partially excavated city just outside Moulay Idriss dates back to the third century B.C. and is a fascinating detour.